1. Preheat the oven to 200ºC, gas mark 6, and grease a large baking sheet. Tip the flour into a large mixing bowl and stir in the baking powder. Add the diced butter and use your fingertips to rub it into the flour until it resembles fine breadcrumbs. 2. Stir 75g of the grated cheese, the thyme leaves and apple into the mixture. Crack the egg into a small measuring jug, beat lightly and then add enough of the milk to make up to 150ml liquid. Make a well in the centre of the flour mix, pour in the egg and milk and bring together with a roundbladed knife to form a soft dough. 3. Transfer the dough onto a lightly floured work surface, knead briefly until smooth then roll it out to 2cm thick. Using a 6cm straight-sided pastry cutter, cut out 10 scones, rerolling the dough as you go. 4. Arrange the scones on the prepared baking sheet, making sure that they are spaced well apart without touching. 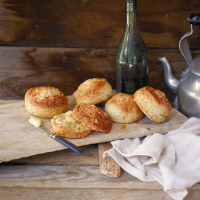 Brush the tops with a little extra milk and then sprinkle a good pinch of the remaining grated cheese over the top of each scone. Bake for 12-15 minutes until well risen and golden. Transfer to a wire rack to cool. Serve warm, buttered, either on their own or with extra Cheddar and slices of apple.